Halloween is a fun time of year when some people go all out, with festive lights and lawn decorations. If you’re trying to sell a home in Santa Barbara, though, you might want to think twice about that. Halloween falls on a weekend this year and it might detract from any open houses that are being held to showcase your property. Don’t worry; you’ll be able to decorate even bigger and better next year in your new home! Buying or selling a home in the fall doesn’t have to be a scary experience! 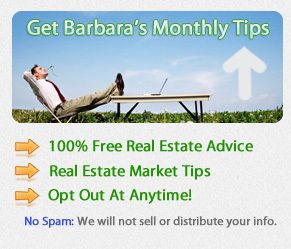 Whether you are interested in Santa Barbara relocation, luxury houses for sale, or home buying tips, I’m here to help. Think About Curb Appeal: While you may like to make your home look like a haunted mansion at Halloween, potential buyers might not appreciate your efforts. You can still decorate, but take a more subtle approach so they can picture what your house looks like throughout the year. You want them to imagine how they will decorate for Halloween, the fall, and the holidays. Understated: Giant inflatable Halloween lawn ornaments are probably not the best idea, especially with luxury houses for sale. Try the subtle yet elegant approach of just a few hay bales with pumpkins and colorful flowers artfully arranged around them. Remember the sun: You want your home to be displayed in its best light, with plenty of sun. Don’t put any decorations on windows that would prevent the sun from doing its stunning best. Be Timely: When Halloween is over, it’s time to take the decorations down. This gives the impression of homeowners who really care about how their property looks. Place an elegant fall wreath on the door and some welcoming fall flowers on the steps. Landscaping: The fall is often the time when the landscaping can begin to look a little ragged. Make sure you keep your lawn neatly raked and trimmed. It might be helpful to place some container flowers in gardens that are at the end of their run. Clean up any patio furniture and outdoor decorations that are showing the wear from the summer. Interior Presentation: As always, make sure your home is free of clutter and has plenty of sunlight streaming in through clean windows. You can add some fall touches, such as colorful throw pillows or a beautiful fall centerpiece on your dining room table. If you have a fireplace, make sure it’s clean and ready to cast a warming spell on potential buyers. Why is it important to have great pictures taken of my house? Over 88% of Santa Barbara home buyers start their research online, so you want your house to make a great first online impression. The photos have to get their creative juices flowing so they will start to picture themselves in your home. The pictures must be good enough to motivate the next step of driving by or setting an appointment. What disclosures will I need to make if I am selling a Santa Barbara home? Sellers should be aware that there are a variety of disclosures that they will want to familiarize themselves with including the Seller’s Transfer Disclosure Statement, Seller’s Property Questionnaire, Statewide Buyer and Seller Advisory, and the Water Heater, Smoke Detector, Mold and Lead Disclosure. Make sure you read and understand these documents carefully as they are part of your legal agreement with the buyer. How much can I afford to pay for a monthly mortgage? Use our mortgage calculator to get a rough estimate of what you can afford. Enter your gross monthly income, new home information, and current debt to calculate your mortgage limits. 3rd Annual Voodoo Lounge Halloween Dance Party: This rooftop dance party takes place at the Canary Hotel on Friday, October 31 from 9pm until 1am. Enter the costume contest to win a $250 first place prize. Music by DJ Scott Topper – dancing zombies welcome! Dia de los Muertos Celebration: Takes place at the Santa Barbara Bowl on Saturday, November 1. Doors open at 4:00 p.m. Musical offerings include some of the most influential contemporary Latin bands and DJs. Art, dance and cultural revelry will be in abundance. The historic Bowl is transformed into a magical place inspired by the Day of the Dead festivities. This all-encompassing community event will showcase local theater, dance, art installations and altars made by local organizations, schools and museums. Howls & Owls: At the Santa Barbara Museum of Natural History on Thursday, October 30 from 6:00-8:30 p.m. Dress in a costume and bring a flashlight. Arrive at 6pm and explore the Museum halls while learning about owls, coyotes, spiders and more! No reservation required. Blush Restaurant & Lounge: On October 31st, Halloween Night, stop by Santa Barbara’s best lounge in the downtown area and compete the “Superheros vs Villains” costume contest!